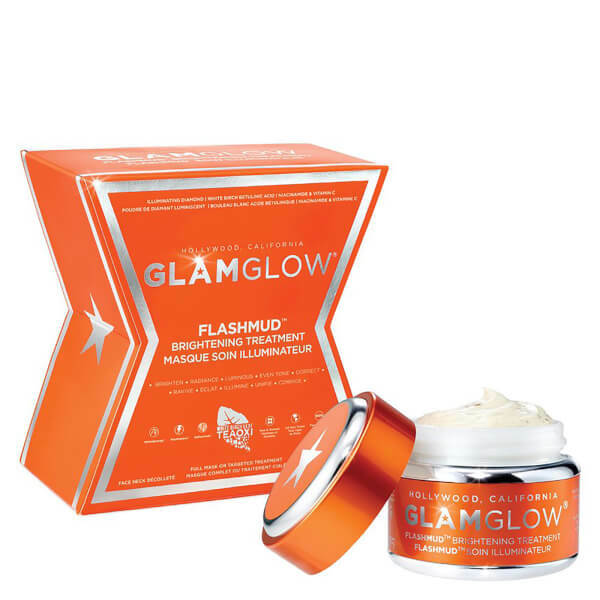 Treat lack-lustre skin to the GLAMGLOW Flashmud Mask; a luxurious, radiance-reviving facial treatment that works to restore a glowing, healthy-looking complexion. Harnessing the powers of Flashlucent™ and Reflectrum™, an innovative blend of light-reflecting ingredients boosted with ultra-fine Diamond Photoluminescence, the revitalising formula combats dull, uneven skin and dark circles to reveal an energised, awakened complexion. Suitable for men and women of all skin types, you can expect restored luminosity and a picture-perfect finish. Apply to dry face in circular motions to pre-exfoliate for improved ingredient absorption. Leave on for 20 minutes. Product will turn semi-transparent as ingredients absorb. Wash off with water. Use 3 days in a row for improved results. Thereafter use 2-3x per week for maintained results. Must use High-SPF sunscreen daily to protect & maintain results when using FLASHMUD™. Results will be lost during extended and/or direct/unprotected sun/sunbed exposure. Always follow directions. Water, Kaolin, Synthetic Wax, Cetyl Alcohol, C12-15 Alkyl Benzoate, Butylene Glycol, Acetyl Glucosamine, Niacinamide, Polymethylsilsesquioxane, Pumice, Glyceryl Stearate, Peg-100 Stearate, Pentylene Glycol, Quartz, Betula Alba Leaf Extract, Betula Pendula Wood Powder, Tetrahexyldecyl Ascorbate, Paeonia Suffruticosa Root Extract, Jasminum Officinale (Jasmine) Flower Extract, Lilium Candidum Bulb Extract, Rosa Canina Flower Extract, Camellia Sinensis Leaf Extract, Magnesium Aluminum Silicate, Tocopheryl Acetate, Diamond Powder, Polymethylsilsesquioxane, Xanthan Gum, Fragrance (Parfum), Benzyl Alcohol, Linalool, Amyl Cinnamal, Benzyl Benzoate, Benzyl Salicylate, Geraniol, Hexyl Cinnamal, Limonene, Potassium Sorbate, Lactic Acid, Allantoin, Disodium EDTA, Ethylhexylglycerin, Salicylic Acid, Glycerin, Ribes Nigrum (Black Currant) Seed Oil, Octyldodecyl Oleate, Octyldodecanol, Octyldodecyl Stearoyl Stearate, Rosmarinus Officinalis (Rosemary) Leaf Extract, Solidago Virgaurea (Goldenrod) Extract, Titanium Dioxide (CI 77891), Phenoxyethanol. Please be aware that ingredient lists may change or vary from time to time. Please refer to the ingredient list on the product package you receive for the most up to date list of ingredients.